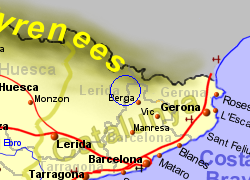 The Sierra de Cadí-Moixeró Natural Park sits on the borders of Lerida and Barcelona provinces, approximately 250kmnorth west of Barcelona city. This is the largest park in Catalunya, encompassing limestone montains rising to over 2500m, on the southern edge of the Pyrenees (the Pre Pyrenees) covering over 400sq Km. The park as whole ranges from 800m in the valleys to 2,648m at the La Canal Baridana peak. One of the most popular spots is Pedraforca, a twin peaked mountain rising to 2,497m, the north face of which is sheer for nearly 800m and attracts experienced rock climbers. In the valleys you will find lush vegetation including pine, beech, maple, aspen, juniper and rhododendron, plus, you will also find hay meadows. At higher levels you will find alpine meadows with wild flowers including gentian, crocus and alpine anemone. The relatively high rainfall in areas creates some rivers and waterfalls, though being limestone, much of the water drains naturally. This is an important area for bird watchers, with the following being on their list(amongst many others) Griffon Vulture, Golden Eagle, Short-toed Eagle, Peregrine Falcon. 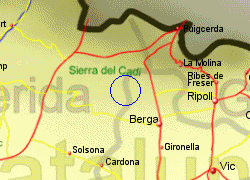 There are 4 vistor/information centres, located at Bagà, Bellver de Cerdanya, Martinet, Saldes. 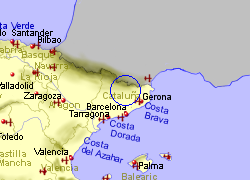 Map of the Cadi-Moixero Natural Park area.